Sight words is a common term in reading that has a variety of meanings. When it is applied to early reading instruction, it typically refers to the set of about 100 words that keeps reappearing on almost any page of text. “Who, the, he, were, does, their, me, be” are a few examples. Unfortunately, this means minimal teaching. Often, little is done other than to show the word and tell the child what it is “saying.” For many children, this is not enough, with the result that their reading of these critical words is laden with error. What does this mean for parents who are helping their children master reading? Basically it means spending some time in truly teaching these words so that your child gains real mastery of them. The key to achieving this goal is accurate writing (spelling)—via memory. That is, the child writes the word when the model is not in view. You can do this by creating simple sentences that the child reads. (By using sentences, you will automatically be using many “sight words.” In addition, you will be giving your child the opportunity to deal with words in context—a key to meaningful reading) After showing the sentence and having your child read it, turn it over and then dictate the sentence. If there is an error, you immediately stop your child and take away the paper. Then you show the model again and repeat the process. In other words, the writing of the sentence has to be fully accurate, starting with the first word. If you want a list of those words to help guide your efforts, here is the top 100 according to the American Heritage Word Frequency Book by John B. Carroll. Click here to download our Recommended Top 100 Sight Words. Dr. Marion Blank is answering your questions about reading and learning. If you have a question for Dr. Marion, visit the Reading Kingdom Facebook Page and let us know how we can help. 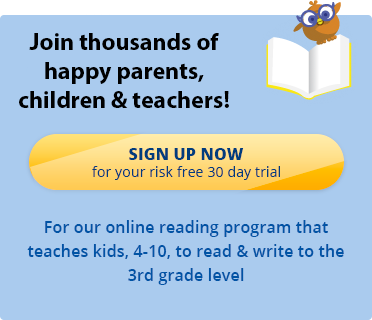 If you think the Reading Kingdom program can help your children learn to read, enjoy a free, 30-day trial here.